Bonus: Exercises & real-world scenarios to create a plan and protect your employees. Almost 70% of working women do not report sexual harassment for fear of retaliation. That’s why women leaders need to create a safe space for them to report. 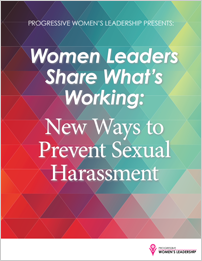 By empowering you to end sexual harassment in your own workplace, this leadership guide is full of strategies to handle complaints quickly, carefully and confidently.